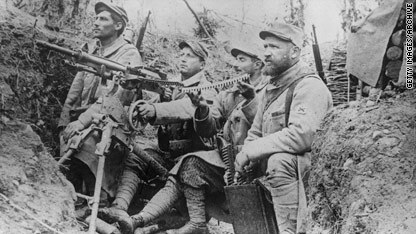 A French machine gun crew mans a Hotchkiss gun on August 1, 1915. Germany and the Allies can call it even on World War I this weekend. On Sunday - the 20th anniversary of East and West Germany unifying about a year after the Berlin Wall fell - Deutschland will make the last in a series of reparation payments that has spanned more than nine decades. The final payment is £59.5 million, about $93.8 million, reported London's Telegraph newspaper. Germany had to pay Belgium and France for material damages and the rest of the Allies the costs of fighting the war. The initial tally in 1919, according to the German magazine Der Spiegel, was 96,000 tons of gold but was slashed by 40 to 60 percent (sources vary) a few years later. The debt was crippling, just as French Premier Georges Clemenceau intended. Germany went bankrupt in the 1920s, Der Spiegel explained, and issued bonds between 1924 and 1930 to pay off the towering debt laid on it by the Allied powers in 1919's Treaty of Versailles. Under the treaties of Saint-Germain-en-Laye and Trianon, other Central Powers, namely the Austro-Hungarian empire, were forced to cede significant territory to Poland, Italy, Romania, then-Czechoslovakia and various other Slavic nations. Germany thought U.S. President Woodrow Wilson's "Fourteen Points" would provide the foundation for a future peace treaty, but Great Britain, France and Italy were still bitter, according to the U.S. Holocaust Memorial Museum. French run from an explosion during WWI. France had been the most devastated by the war, and Clemenceau feared Germany might attack France again if it recovered, so he and other European leaders sought to stifle the nation's economic recovery, and in effect, its ability to rearm, the museum said. Restrictions were placed on its army and navy, and it was forbidden to have an air force. The Treaty of Versailles not only forced Germany to give up territories to France, Belgium, Poland, the Czechs and the League of Nations, but it also included a "War Guilt Clause" forcing Germany to accept responsibility for the war, thereby making it liable for the damages. Britain's John Maynard Keynes felt the treaty's demands were too steep and resigned in 1919 after warning, "Germany will not be able to formulate correct policy if it cannot finance itself." As Keynes predicted, the plan backfired. While Austria, Hungary and Bulgaria all violated the terms of their accords, mainstream voters flocked to Germany's right-wing parties and Adolf Hitler's Nazis rode to power on a wave of resentment over the Treaty of Versailles' terms, according to the Holocaust museum. World War I historian Gerd Krumeich told Der Spiegel that Hitler's message of tearing up the treaty and restoring Germany to greatness resonated with the country. "There was tremendous frustration in Germany in the 1920s - this conflict that cost 2 million lives and left 4 or 5 million wounded is supposed to have been in vain, and it was all our fault?" Krumeich told the magazine. "The reparations payments compounded everything. Not only was Germany given the moral blame, it was also supposed to pay an outlandish sum that most people had never even heard of." Germany discontinued reparations in 1931 because of the global financial crisis, and Hitler declined to resume them when he took the nation's helm in 1933, Der Spiegel reported. After reaching an accord in London in 1953, West Germany paid off the principal on its bonds but was allowed to wait until Germany unified to pay about 125 million euros ($171 million) in interest it accrued on its foreign debt between 1945 and 1952, the magazine said. In 1990, Germany began paying off that interest in annual installments, the last of which will be distributed Sunday. Sad.. the war was Frances socialist fault for taking the Ruhr industrial valley. good. so when is america going to start paying reparations to Iraq and Afghanistan? If Germany had won that war it might be Britain paying off the final interest this week, not Germany. As with war crimes trials, only the losers pay, and all of europe contributed to the mess that led to WW1, not just Germany. When they pay everyone off, do they get Danzig and Prussia back? do the jews pay off lebanon, palestinia, & Jordan? do the US pay off Vietnam, Cambotia, Irak, Afghanistan?, do the british pay of any commenwealth country they blundered? Glad to see Germany still brings the best out of people!! I don't know what Ben said but I think I could guess by what the reaction has been. I think understanding the political spectrum is really important though. I'm so surprised by how many Americans don't understand where Socialism and Facism fall on the political scale when speaking of right and left extremes. So many Americans use words and language when they have no idea what it is they're talking about. I believe that is why this country has become so polarized. How can we have meaningful discusions when so many people are so passionately ignorant? The public schools aren't the problem either. This has to do with problems in American culture... laziness, arrogance, and apathy. This dept thing was supposed to cripple Germany? Its one of the richest countries in the world! How again was it supposed to work? They're one of the richest countries in the world because the Allies learned from their mistakes with the first war. Punishing may make the victors feel good, but it never helps anything. Instead, the Allies helped rebuild a healthy, stable democracy (which also helped contain the Soviets to the east). Look up "Marshall Plan." Although well concealed, many Germans continue to believe Nazi theories. They are not friendly and open people, but closed and arrogant. Their architecture speaks of their soul - plenty of cold concrete buildings and strong high fences everywhere. Written content –wherever it happens to be - always seems to have an abundance of orders and exclamation !! marks. They are highly trained not to reveal it, but get one a little under the influence of alcohol, use a few trigger words, and you see how racist and xenophobic they still are. Drive a swiss-registered car or expensive car across their border into the Poland and you will often be stopped by German police for a Kontrolle. Drive a Czech car into Germany, and you will be stopped for a Kontrolle. Read the local papers about the evil Czechs who were supposed to murder people once border controls came down pre-EU and the hordes of people who would come to take their jobs. None of this happened. Violent crime rates in Germany are higher than in many eastern european countries, although of course it must be foreigners doing it. Oh, and look at the irresponsible Greeks and Spanish with their debts which we the Germans ... who know how to run an economy ... must support. Watch their driving on the Autobahn. They are not nice. They push each other around at extremely high speeds. Flashing lights. There is no courtesy. There is no room for error. They are still a scary people. Sad for them. is uninspiring - use of concrete, and Try living in a German village today. You'll see they are potentially a dangerous group which must be monitored closely and controlled by the neighboring countries. @David James, Have you ever lived in Germany for any length of time??? I lived there (I'm American) from 2004-2009 and we are moving back in January for another 5 years (our choice). We thought the German villages were beautiful and so did all of our American visitors. We have many German friends now and find them to be a very generous and fun people. Sure, they are not all fake smiley like some Americans are but once they get to know you it's a different story. I felt more a sense of community there than anywhere in the US I have lived. I am looking forward to going back! Oh yeah, rule of the autobahn – stay out of the left lane unless you're passing someone. This is the law and they will be rude if you break it. good for germany, they can finally move on. Heya i am for the primary time here. I came across this board and I to find It really helpful & it helped me out much. I'm hoping to give something back and help others like you aided me.